The Capricorn-Aquarius cusp can be likened symbolically to the period around seventy years of age in the human life; it arrives at the time in winter when the days are lengthening but remain cold in the northern hemisphere. Indeed, nights are freezing and refuge must be sought inside. The Capricorn-Aquarius cusp may be said to represent Mystery and Imagination. In human development, at the age of seventy, one must certainly come to terms with one’s own mortality. Preparations must be made to make one’s remaining years comfortable but also productive and satisfying. Although external activities have usually slowed down considerably, ideally a corresponding increased tempo of the interior life - mental, emotional, and spiritual - can manifest. The worlds of imagination, fantasy and dreams are active, and some feel and act in a childlike manner. 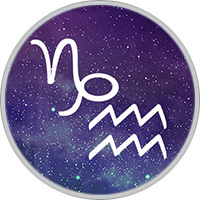 The days that comprise the Capricorn-Aquarius cusp exemplify some of the manifestations of Mystery and Imagination where the practical, conservative Capricorn nature clashes with unpredictable, unconventional Aquarian impulses. The vivid and expressive individuals born on the Capricorn-Aquarius cusp generate excitement wherever they go. Capricorn-Aquarians’ interest in the poor and most of them will not hesitate to make direct contributions of time, money or energy to help any one less fortunate than themselves. At the same time, however, they have little sympathy for those they see as free-loaders or parasites, able to pull their own weight but refusing to do so. Capricorn-Aquarians love to tell and play jokes. Their mates, friends and family must not only understand but appreciate this need if those born in this week are to be kept happy. It isn’t always easy, however, to keep up with Capricorn-Aquarians, who may one moment be dealing seriously with day-to-day problems, the next exploding in riotous laughter. Capricorn-Aquarius Cusp is anything but dull. They may be flamboyant and exciting. Even those born in this sign that seem quiet and unassuming have a vivid dream and fantasy life… they just prefer their excitement in private. They may be prone to unusual experiences. They are usually very visual. They may experience vivid dreams that make their waking life dull in comparison. This dream world may become their inspiration for creativity in writing, art or other endeavors. Capricorn-Aquarius needs to find an outlet for their creativity. They have a deep need to communicate what they experience. They need to learn how to let go of negative criticism and lack of understanding by others. When they find someone who understands their creativity, they will be most happy. Capricorn-Aquarius are responsible and may be reserved in manner. They can be critical or bossy, but they want to keep everything to high standards and succeed. They may have talents that are both creative and scientific. They may be driven to change things for the better. Capricorn-Aquarius enjoys healthy competition. They like to be social, and love a good intellectual discussion. They can set goals for themselves and keep their nose to the grindstone until they achieve what they want. This ambition gives them a great deal of drive. They can often get away with breaking the rules in order to bring something new to light. They are hard workers and very innovative. Capricorn-Aquarius must enjoy learning to avoid being thrown out of balance by life’s unexpected challenges. If they learn to recognize the benefit even in negative experiences, they will go far. They feel a need for security, but at the same time they relish freedom. They need to find the right balance. The Cusp of Mystery and Imagination is known to be disciplined, patient, loyal, traditional, ambitious, offbeat, progressive, cautious, practical, friendly, realistic, curious, stable, funny, confident, unique, attractive, competitive and multi-talented. They may also be rebellious, narrow-minded, cold, harsh, depressed, stubborn, secretive, aloof and over-critical. They are good at business of any kind. They are methodical, exacting and can manage well. Capricorn steadies Aquarius’ volatility, while Aquarius lends Capricorn some originality and fun. While Capricorn likes to establish and take stock of things, Aquarius likes to throw them around and see where they fall. They may be great philanthropists, or they may be selfish. They enjoy talking and entertaining. Individuals born on the Capricorn-Aquarius cusp are proud of their triumphs in social and intellectual circles. They are good at earning a living. They are not so talented at maintaining personal relationships and may suffer difficulties in this area. They can be very perceptive and intuitive if they let themselves develop this talent. They generate excitement wherever they go, and they are lighthearted, entertaining but they are choatic, difficult and eruptive also. You must find an outlet for your creative energy. Communicate what your experience. Try not to be discouraged by lack of understanding, ignorance or negative criticism. Don’t go off the deep end, but, rather, find those who understand and appreciate you.